It’s that time of year again! Time to start our “Easter & Bunnies Don’t Mix” campaign. Our Scully was an “Easter Bunny” present to some kids, and was then dumped at the pound. She was traumatized from her early experiences in life. It took a lot of work and time to make her finally feel safe enough to be touched by humans again. We have finally gained her trust, and she is happier than ever being a free-range house bunny. I am so glad she came into our lives, despite the rough beginning she had in life. Help us spread the word with our PSA, so more bunnies don’t have to start their lives like Scully did. Bunnies are not Easter presents, and not Easter bunnies. 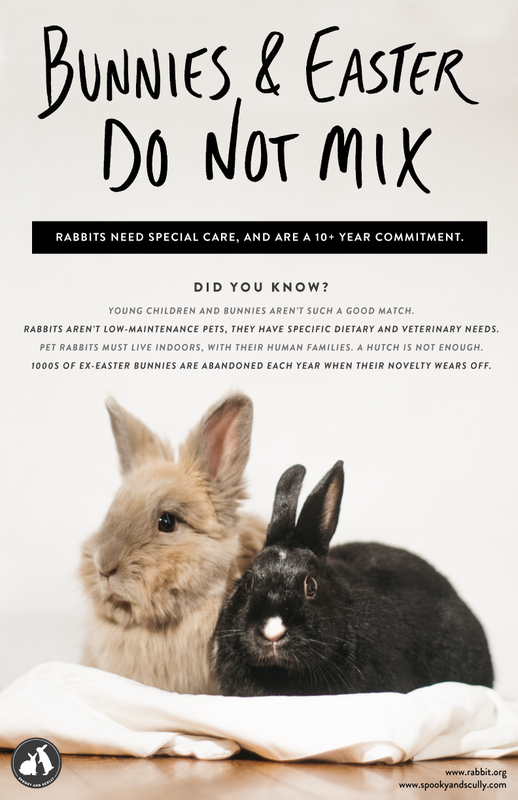 They are HIGH MAINTENANCE pets that require special care, attention and commitment. Here is a high quality PDF that you can download and print to post at your local pet shop. The size is 11×17.